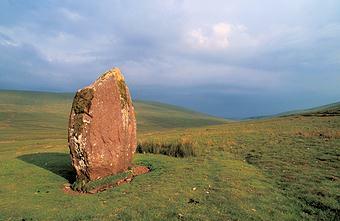 Wales is home to the Preseli mountains, which are the source of both the granite 'Bluestones' and the Green Mica 'Slaughter stone' at Stonehenge. The unnecessarily long distance the stones were transported suggests that the stones or region they came from held an important symbolic significance in the eyes of the ancients. Chris Barber noted the significance of the 'presence of so many Arthurian sites near to Gors Fawr... Arthur may be considered as Arth Fawr, the Great Bear and a representation of the Polar force' (3). 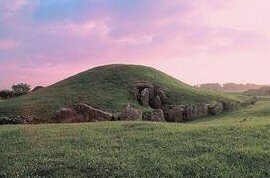 He also made the connection that the dolmens of Wales tend to be sighted on the Great bear, and that the region of Gors Fawr is the same one that the famous bluestones of Stonehenge originated. Brynn Celli Ddu - Passage-mound. 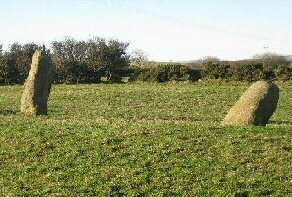 This beautiful Kerbed passage-mound was designed and executed so as to measure the solar year with the deliberate positioning of an independent standing-stone inside the chamber, upon which markings can be seen which coincide with the light of the passing sun over the stone at relevant times of the solar year. The passage is orientated towards the rising summer-solstice sun. Whiteleaved Oak - Apart from being at the geographic junction of three county borders (Hereford, Gloucester and Worcester), the proposed centre of John Michell's 'Great Decagon', and therefore, a hub for Britain's ancient 'Perpetual Choirs' and sitting almost exactly on the 52nd latitude, the importance of this seemingly invisible village is only now seen in its name. Whiteleaved Oak was suggested by John Michell to be the exact centre of a huge geometric alignment of ancient sites he called the 'Great Decagon' which includes both Glastonbury and Stonehenge. These three sites (at least), are accurately aligned to within 1/1000th part tolerance, suggesting the outline of a decagon in its completed form, and supporting the idea of an extended prehistoric landscape, connected by geometrically aligned 'sacred' monuments. 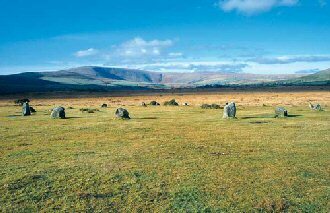 Gors Fawr (Carn Menyn): Stone-circle, Sacred Landscape, location of the Stonehenge 'Bluestones'. The Gors Fawr stone-circle is one of Wales best preserved stone circles, it is a part of the prehistoric 'sacred' Neolithic landscape focusing on the prominent Carn Menyn natural outcrop of blue-spotted dolerite granite in the Preseli mountains, from which over 80 were transported to Stonehenge. 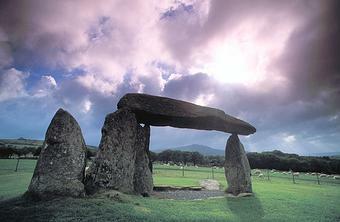 Pentre-Ifan: The skeletal remains of one of Wales most visually satisfying monuments. The estimated 16-ton capstone now only rests delicately on three tapered stones. 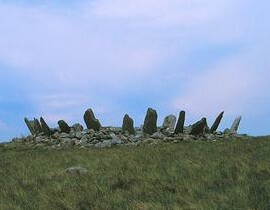 Dating from between 4,000 and 3,500 BC, the outline of the original monument reflects the silhouette of distant Carn Ingli mountain on the Western horizon, a feature seen at other British megaliths (see Orkneys for example). 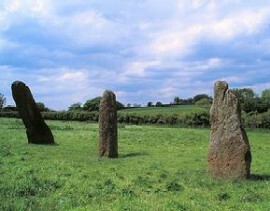 Meini Gwyr: Unique Welsh 'Henge-circle' (without a ditch). The sad remains of this once important Neolithic 'ceremonial' monument are today down to just two stones. Passage mound. Light-box. Solar Orientation. Stone circle. 'Ceremonial' landscape. Location of 'Bluestones'. 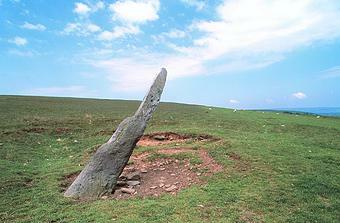 Dolmen, largest capstone in Wales. Whiteleaved Oak. Spiritual and geodetic centre of Wales. 3). Cope. J. The Modern Antiquarian. 1998. Thorsons publ.